For A Glimpse Beyond the Terminus marks the second collection of horror, emotion and oddity by author Jordan R. Anderson. Within these pages, a middle-aged man encounters oddity in a used car purchase, and a pair of detectives investigates the aftermath. A young employee of a tech firm discovers strange abilities in the wake of losing his virginity. After the stillbirth of her child, a woman flees from her pursuant nightmares into the arms of her sole blood relative. A boy’s patience is tested and his faith is challenged as he awaits prophecy under the guidance of his mother’s righteous fervor. These and other tales lay elbow-to-elbow like corpses in a mass grave, offering unique struggles and differing perspectives on the meaning of life, death and the spaces between. I’m a huge fan of horror stories, so when I saw a request from the author to review this book pop up in my mailbox, I simply couldn’t resist. Not only does it have an awesome, fitting cover, the stories inside are pretty awesome too. Usually with short story collections, they end up being a bit of mixed bag, with some excellent stories, some mediocre ones and one or two that are not so great. 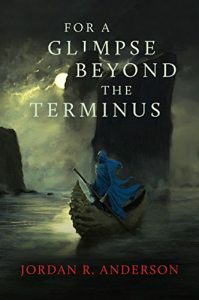 With For A Glimpse Beyond The Terminus, none of the stories really fell into the latter category – some stories were excellent, some were mediocre, but there wasn’t a single one that I didn’t like. “The Midnight Baby” and “Master” were my two favorite stories in the collection. I also really liked the plot of “The Harem Within” and how it was executed. Perhaps my least favorite was “Under and In and So It All Begins”, but several other reviewers mentioned that as their favortie, which just shows you can’t argue with taste. Author Jordan R. Anderson has the uncanny ability to sketch his character’s personality in a matter of minutes, like a painter bringing a portrait to life in just a few brushstrokes, and he masterfully creates an eerie, unsettling atmosphere in all of his stories. I just finished this one, and I’m already looking forward to the next collection!